I love celebrating any occasion with good friends and good food and the 4th of July is no exception. We’re heading to a BBQ at my neighbor’s house this weekend and I’m on the hunt for some practical and festive hostess gifts. My neighbor Christine, an interior designer herself, has great taste and a beautiful home so I want to bring a gift that’s unique, useful and won’t break the bank. BOOKS – as far as I’m concerned you can never have too many books. Art books and cookbooks are great hostess gifts and Alex Katz’s 45 Years of Portraits (pictured above), Vefa’s Kitchen or Malibu Farm Cookbook make great 4th of July gifts. GOURMET – delicious gourmet snacks are always a hit in my book. Jenni Kayne carries Chocolate Cake Mix (pictured above) and Vegan Caramel by Sweet Laurel – their products are all grain-free, dairy-free and refined sugar-free, but they actually taste good! 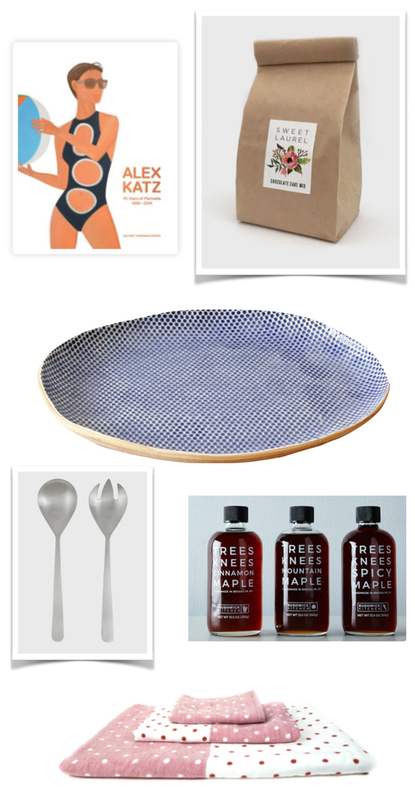 A Maple Syrup Set (pictured above) or even Ice Cube Trays are fun gift ideas as well. KITCHEN ACCESSORIES – a friend once gave me salad servers as a hostess gift which I still have. I think of her every time I use them. If you want to be remembered too, get either this (pictured above), this or this for your host this 4th of July. LINENS – all my friends know I’m a sucker for table and bath linens. They’re endlessly pretty, useful and often inexpensive. For bathroom hand towels go for these polka dot Hand Towels (pictured above) or these guest towels from Nickey Kehoe. Roberta Roller Rabbit always has a great selection of table linens, I like these and these. CERAMICS – your host will definitely be happy with a pretty Platter (pictured above), a Mixing Bowl or a tumbler like this filled with hand picked flowers.